Recent news that seven orca whales are missing from the count in Puget Sound adds to worry over the health of the whales. It's presumed the whales may be dying out from various factors including starvation from lack of salmon. No one knows for sure. It's another thing to worry about. Looks like people watching is more beneficial than whale watching in this crowded and increasingly developed Puget Sound region. Also in the adjacent waters of Canada. Enjoying the company of cute naked guys was one of the goals of a boat trip I took several years back. I was headed out to the San Juan Islands for a dip in Doe Bay Resort's "clothing optional" hot tubs. No shortage of people in this region of growing population. Might as well celebrate humanity. I didn't really care that much about seeing whales, but the boat I was on had a dual purpose. It's a ferry run from Bellingham out to the islands. Then it does a whale watching loop after leaving regular passengers off at the islands. I didn't do the whale watching loop, it costs extra. I spent the day and night camped on the island and then took the boat back to Bellingham next day. On my way back, the boat was full of disappointed passengers. No whales had been seen during the whale watching loop that took place earlier that afternoon. Hard to predict where whales will be. I'm sure they tried to make the best of it. Plenty of snacks on board. Lots of historic sights, geology and interesting stories to relate over the boat's PA system, but no whales were to be seen. I was just on board for the return trip to Bellingham, my goal being the hot tubs and some bike riding on the islands rather than whale watching. Well, wouldn't you know, like a watched pot that never boils, whales started jumping all around the boat. The PA came on to announce this unexpected treat. Engines turned off and we sat in the bay watching the whales play. It was just icing on the cake for me. We were a bit late getting back into Bellingham Bay, but that was OK. Quite a spectacular show. Whales aren't always where people expect them to be. Whale watching loop saw nothing that day, but on the way back to harbor, where people didn't expect to see it, the whales were jumping. It can be like a watched pot that never boils. Some folks fear the effects of shipping on whale populations. 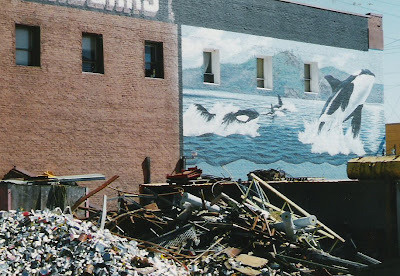 Many years ago, I read a story, in the newspaper, about some study of the effects Puget Sound shipping has on whale populations. Study concluded that ships going about their normal business weren't a big problem, but there was some worry about the boats that chase the whales trying to get a better look. 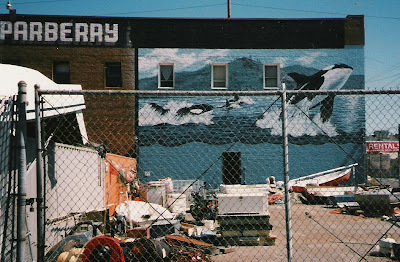 Painted wall of Parberry's in Bellingham near recycling yard. From what I hear, the whale watching industry is aware of this problem and there are guidelines to try and protect the whales. Keeping a distance, shutting off the motors when near whale pods and so forth. Still, it's a worry as there are lots of boats chasing around in the sound. Not just the whale watching cruises, but many private vessels as well. Another problem is loss of salmon habitat on rivers that drain into the sound. Since whales feed on salmon, good streams are needed. Rivers can be damaged from development that spreads out into local watersheds. Maybe the people should just embrace the cities and live in high rises rather than spreading out into nature. This way they can leave whales to their habitat and not pollute the more rural watersheds. Keep the natural areas free of their cars, houses, driveways. There's never a shortage of people to watch. If one does travel into nature, go by bicycle or at least have a light footprint. I'd guess the whale watching industry does, for the most part try to be careful and not destroy it's reason for being.